Here’s a quick refresher to keep this BBQ season healthy and tasty! 1. 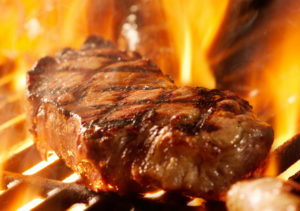 When you grill meat for long periods of time and at high temperatures (300 F and above), a dangerous chemical reaction occurs that produces cancer-causing HCA’s (hetrocyclic amines). Take-home message: Grill but don’t burn meat—rather, aim for it to be medium rather than well done. 2. When you BBQ fatty meats, the fat drippings create smoke that is full of cancer-causing chemicals called PAH’s (polycyclic aromatic compounds), and as the smoke envelopes the meat during cooking the PAH’s go into the meat. Take-home message: Grill leaner meats like skinless poultry, or those that contain good fats like fish. 3. With a gas grill you can control the temperature because you can control the flame, whereas with a charcoal one you can’t. Take-home message: We recommend that if you are going to use a BBQ, go with a gas grill rather than a charcoal one.